Well guys as you all know it has been a big secret since posting back in March. Tonight's your lucky night to find out. Quick Recap of my order details and spec. 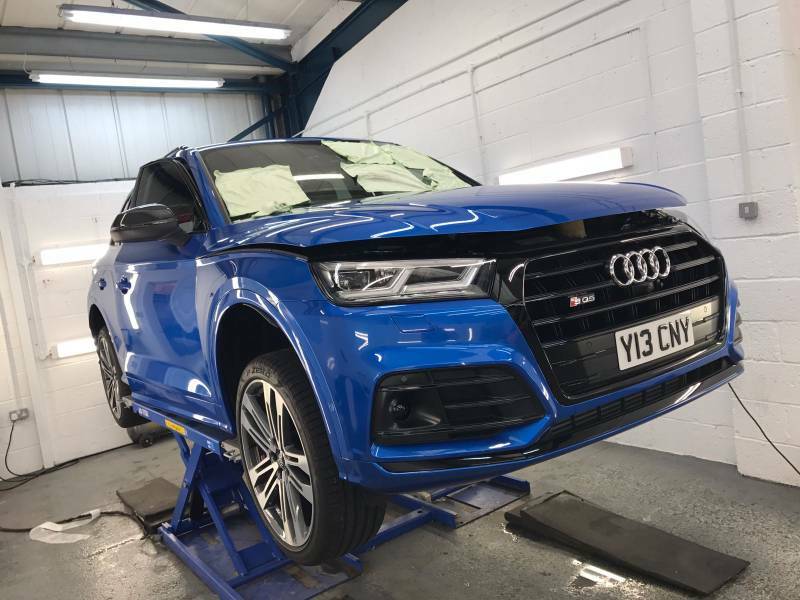 Ordered 4th Jan 2018, arrived at Glasgow Audi on the 29th June. Hope you all like it and keep in mind the car hasn't been washed at all since factory in these pictures and some bits need fixing that I'm not quite happy with yet but shall be rectified this week by Audi. I'll post pics in a few weeks once been to the detailers for full interior and exterior Gyeon Ceramic Coatings and full front end Xpel PPF wrap. RS4B5, SPIKE_S3, Ian66 and 6 others like this. Congrats on the new motor and well done for keeping the colour quiet for so long. q5man and CC-SQ5 like this. It's been a tough 7 months keeping it quiet I'll admit that. Have you gone for any paint treatments. Very nice Also wonder how you managed to keep colour quiet for so long, fair play. Loving the Ara and black/CF combo. How did you get the black pack? It's not officially available in the UK until MY19. Along with a Vorsprung trim at SQ5 money for the 2.0 TFSI. About time too. At least one wait is over. My loaner arrives today...what's it gonna be?? I got Audi to paint all the bits black, but they haven't done it properly so rejected collection of the car. I didn't even know it was going to become available tbh I just knew that the EU cars and American can get black editions. Ended up phoning TPS and Glasgow + Edinburgh Audi parts for a price to buy them all - £3,773.63 excluding fitting haha. However I still had my pants pulled down to paint front grills etc and recalibrate the front camera systems because the bumper was being removed. In the process of writing my complaint to the body shop manager. Pick up next Sunday now probably. Stunning colour in the sun light, my phone can't seem to get a true picture of how good it looks. BarryG79, paul wev and q5man like this. 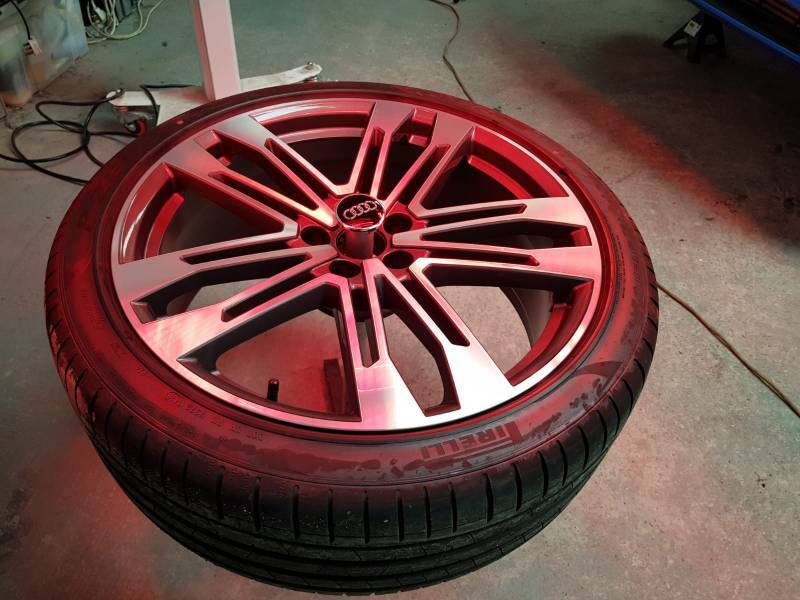 Looks epic in that colour with the black pack - thats going to be my next colour! CC-SQ5 and q5man like this. Sorry just noticed this post mate, I posted above about it - had my pants pulled down by Audi to paint them. And yeah it's booked in for the 30th of this month for full new car correction and Gyeon Ceramic Coatings all over. Wing mirrors definitely a favourite of mine, expensive but well worth it. Looks great but I am not sure I would pay £4k+ for the black pack...although would go for the wind mirrors..which I assume most of he money went!!! I have gone for the Gtechniq Ultra coating ..not sure if there is much difference with Gyeon. paul wev and q5man like this. Thankfully never paid that much for the black stuff lol. The wing mirrors were £500 from Audi parts dept. Yeah I have been a big fan of gtechniq for a few years now but liking the gyeon stuff at the minute. Have you got any pics of your car? No RS but an S-Line Q7 will do. At least I’m mobile again. Noce look @CC-SQ5 post what is the status of the repainting? Basically took £120 off the cost, the window trims had to be wrapped but both attempts I rejected it due to it peeling. So took the cost of the wrapping off and I've agreed to take the car as is until they give me a price tomorrow to replace all of the trims with the original Audi parts as they refuse to paint them due to rear quarter windows not being able to separate from the trim and would need to be replaced completely. I'll officially take delivery of it on Saturday though and return at a later date for the trims. 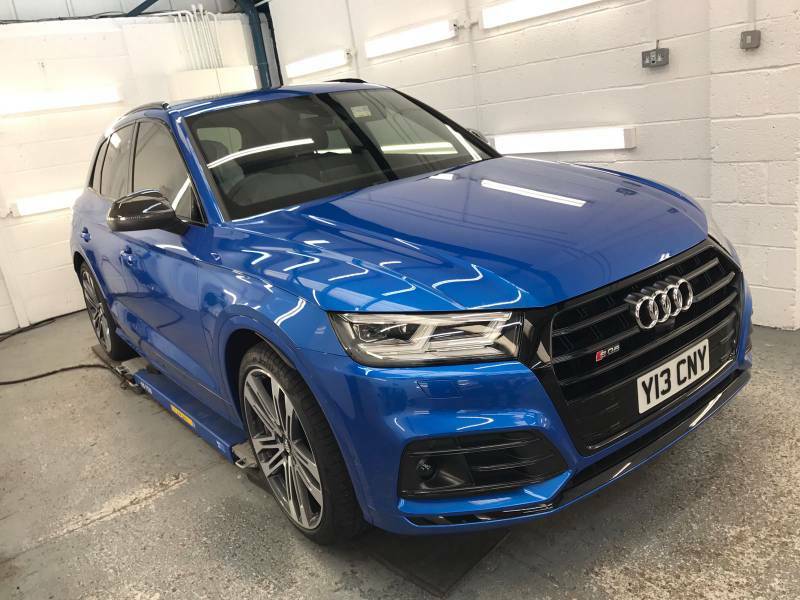 Dropped car off at the detainers today and we’ll get this back around lunchtime on Saturday...photos will be loaded then...cannot wait..
Gorgeous SQ5.....Ara and black pack is a match made in heaven! Thanks mate, was a definite on the black pack for sure. Yeah I picked the car up last Saturday, and dropped it off Yesterday to the detailers, will have it back Saturday coming. I'll post up some more pics at the weekend. Pinky1959, SPIKE_S3 and q5man like this. Some teaser shots of the car after the PPF has been applied to the front of the car (bonnet, bumper, headlights, wing mirror caps, gloss trim on grill, wings, A pillars, start of the roof) Also had all of the piano black bits PPF'd around the car too as these swirl realllly easily. SunTek PPF used on the bonnet and I believe XPEL was used everywhere else but ill get a full run down when I collect the car tomorrow. 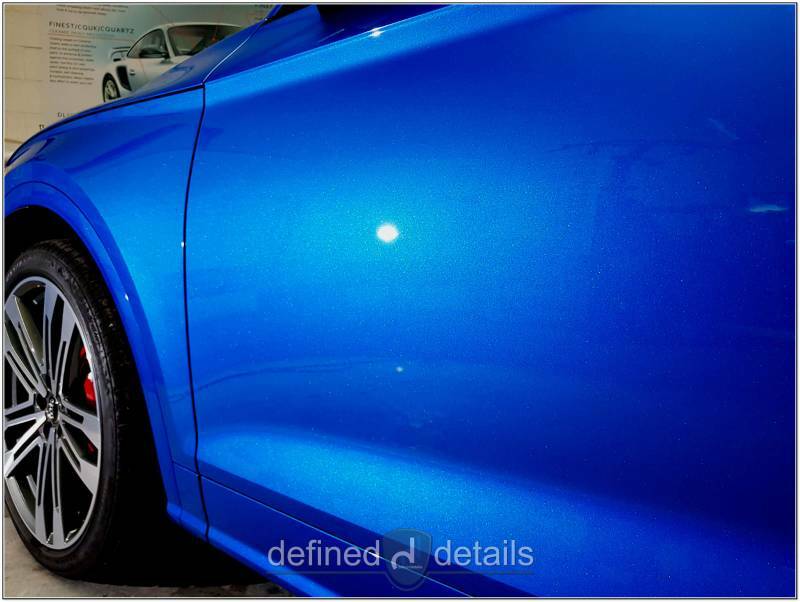 This below is after it's machine polish this is raw with no coating as of yet but Ara blue is doing it's thing! Will post up some more tomorrow at collection guys! Enjoy and let me know what you think so far! Pinky1959 and SPIKE_S3 like this. Oh and can't forget, front tints done 35% huge difference! Radford212, Pinky1959, SPIKE_S3 and 1 other person like this. 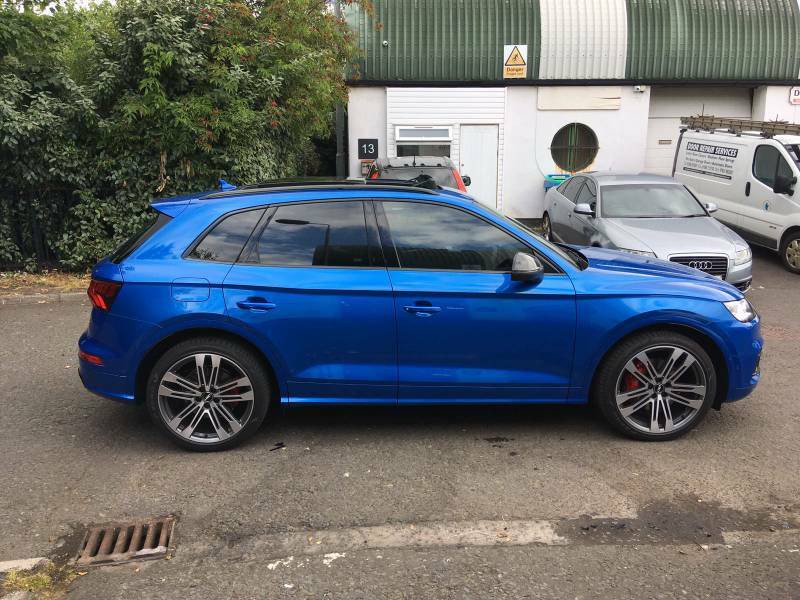 Looking amazing @CC-SQ5 You are spending some serious dosh on your car. Nobody better than Gordon Between him and Hamilton Auto Tints you must live near me. Yeah it's a mixture of Gordy, Hamilton Auto Tints and Robert at Incredible Detail haha. Defintely all masters in their respective trade as yo know! And dosh? None left hahaha! Black pack really does look stunning - have you thought about some black powder coated alloys? I'm afraid I haven't thought of anything for the wheels at the minute I just want to enjoy the car as is. Maybe an SQ7 wheel would be a choice if anything in future. Keep you in mind then bud, maybe after the winter for the summer could think of a change. It's hard to truly see the effects of the fronts tints (usually not into front tints), but it looks to be nice and discreet? I thought the legal maximum tint for the front windows is 30%?